The Wheatbelt town of Tammin is located two hours’ drive east of Perth. It derives its name from a small marsupial found in the area, the Tammar. The Shire of Tammin includes the settlements of Bungulla and Yorkrakine, has a population of 400 and covers an area of 1087m2. 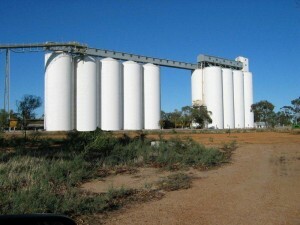 The huge wheat silos, are one of the first concrete silos built in Australia in 1960. They held 13,600 tonnes of grain and were extended in 1996 which increase capacity to 25,990 tonnes. Kadijininy Kep is a dual purpose area hosting a hydrology model which is also being used as a performance space for shows and concerts. It is located within the town site behind the Town Hall with shaded grass slopes surrounded by running water and a water feature. Hunts Well is a historical site located a few kilometres south of the town. Explorer Charles Hunt camped in this area in 1864 and returned in 1865 with men to construct a well as part of a string of wells and soaks at intervals along the route to Southern Cross and the Goldfields. Yorkrakine Rock is a spectacular granite outcrop located 26 kilometres north of Tammin, rising 341 metres high and covering an area of 160 hectares. Charles Gardner Reserve located 14 kilometres south, encompasses 600 hectares of natural vegetation. The reserve is ablaze with wildflowers during winter and spring and contains a variety of species. Silos on ‘94 restaurant is a Licensed fine-dining restaurant.